Whatever Happened to Deathrow Dog Bruce? He is FREE! Thousands of dog lovers from all around the world can rejoice at the news that Bruce, the dog seized in Northern Ireland under the breed specific legislation element of the 1991 Dangerous Dogs Act, despite him NEVER having done ANYTHING resembling an act of aggression or behaving dangerously, is free. Animal welfare campaigners joined forces to bring Bruce’s plight to world attention. Bruce, the deathrow dog is free! He has been released in to the custody of a Galway animal rescue. Seized in September 2007 , the council who incarcerated Bruce openly acknowledged that he was not taken on the basis of anything he’d ever done, but purely on the grounds of what he happened to look like. Breed specific legislation deems dogs as ‘dangerous’ and illegal on looks alone, not actions. 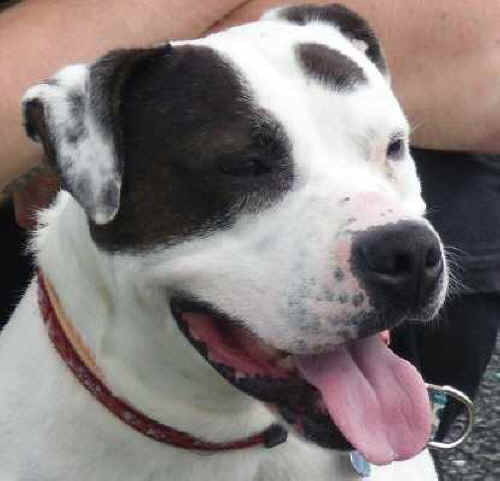 In Northern Ireland, there is not even a clause in place which would allow “Pitbull-type dogs” to be released on the back of a behavioural assessment under the 1997 Dangerous Dogs Act amendment, which is operative elsewhere in the UK, so Bruce’s seizure automatically condemned him to die. Shannon Brown, Bruce’s owner, appealed to the court to overturn his destruction order and a three year battle commenced whilst Bruce remained captive at numerous secret locations at the behest of the Northern Ireland authorities. East Galway Animal Rescue (EGAR) appealed to have Bruce taken in to their care – as they are located in Southern Ireland, where the destruction law is not active. The court heard the appeal and acknowledged that Bruce had an “overall pleasant temperament”, but initially turned it down. That decision was overturned in July and Bruce has been released to the care of EGAR where he is said to be making a good recovery from his three year ordeal.